Attorney General William Barr has made his determination about special counsel Robert Mueller's investigation. Now Democrats want to make their own. The delivery Sunday of Barr's summary to Congress about Mueller's conclusions has opened a new chapter in the battle over the two-year investigation that is likely to consume Capitol Hill in the coming weeks and months. Democratic lawmakers are demanding a full look at Mueller's findings and dismissing Barr's summary as incomplete, at best, and biased, at worst. They have seized on a line in the summary that says Mueller's report "does not exonerate" the president on obstruction of justice — even though Barr concluded the evidence of obstruction is insufficient to find Trump committed a crime. "The fact that Special Counsel Mueller's report does not exonerate the president on a charge as serious as obstruction of justice demonstrates how urgent it is that the full report and underlying documentation be made public without any further delay," House Speaker Nancy Pelosi and Senate Democratic Leader Chuck Schumer said in a joint statement. "Given Mr. Barr's public record of bias against the Special Counsel's inquiry, he is not a neutral observer and is not in a position to make objective determinations about the report." Given the report, Democrats seemed more likely to focus on their ongoing investigations, calls for transparency and frustrations with Barr, rather than engaging with the talk of impeachment that has been amplified on Pelosi's left flank. As the release of Mueller's report loomed, Pelosi recently tried to scuttle that talk by saying she's not for impeachment, for now. 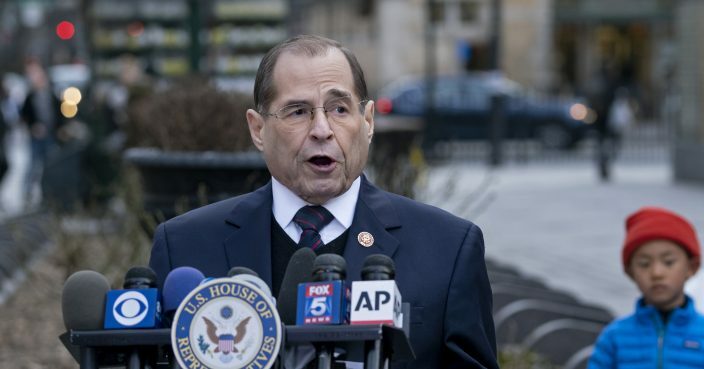 House Judiciary Committee Chairman Jerrold Nadler, who would lead any impeachment effort, said he would call Barr to testify soon "in light of the very concerning discrepancies and final decision making at the Justice Department." Yet while Democrats focused on the obstruction piece, Barr's summary report dealt their investigative efforts an undeniable blow by concluding that Trump's campaign never conspired with Russia. Top Democrats, now leading broad investigations of Trump in the House majority, had long suggested just the opposite. "After 22 months of a special counsel and 2 years of congressional investigations, it's over," tweeted North Carolina Rep. Mark Meadows, a close ally of Trump. "The clock has finally struck midnight on the 'Russian collusion' fantasy." In a joint statement, Nadler, House intelligence committee chairman Adam Schiff, D-Calif., and House Oversight and Reform Committee Chairman Elijah Cummings, D-Md., almost seemed to concede that collusion had not been found, saying they have confidence in Mueller, "notwithstanding the very public evidence of Trump campaign contact with and willingness to receive support from Russian agents." Still, they said, "it will be vital for the country and the Congress to evaluate the full body of evidence collected by the special counsel, including all information gathered of a counterintelligence nature." Democrats discussed strategy in a flurry of calls over the weekend. Pelosi and Schumer talked repeatedly, including several calls Sunday from her home in San Francisco. As soon as Barr's letter arrived, Pelosi quickly convened a call Sunday with Cummings, Schiff and Nadler to go over its main points. They were on the same page with their response, according to a person familiar with the call. Nadler later held a conference call with Democratic members on the Judiciary panel and reiterated calls for transparency. People familiar with the calls requested anonymity to discuss them freely. Republicans unified to call for Congress to move on. "This case is closed," said House Republican Leader Kevin McCarthy in a statement. Trump celebrated the findings but did not appear ready to let the matter drop, calling the investigation "an illegal takedown that failed." He said that, "hopefully somebody's going to look at the other side," an apparent reference to Democrats. Democratic calls for transparency on the Mueller report could set up a court battle with the Trump administration that could take months or years to resolve. It's unclear what else is coming from Barr, though he states in the letter that he is working to make more information public. He said he will be consulting with Mueller to determine what else can be released. But whatever is provided is unlikely to be enough for Democrats, who have said they want all of Mueller's underlying evidence — including interviews, documents and material turned over to the grand jury. Democrats have said they are willing to subpoena Mueller and Barr, if needed, to push for disclosure. Though Trump himself has said the report should be made public, it's not clear whether the administration would fight subpoenas for testimony or block the transmission of grand jury material. If the administration decides to fight, lawmakers could ask federal courts to step in and enforce a subpoena. A court fight could, in theory, reach the Supreme Court. In the meantime, Democrats will keep the focus on full transparency. "I don't want a summary of the Mueller report," tweeted Vermont Sen. Bernie Sanders, a Democratic presidential candidate. "I want the whole damn report." Associated Press writers Mike Balsamo and Lisa Mascaro contributed to this report.